It didn't have a proper music video. It was performed by a model discovered in a night club. It had some pretty dodgy lyrics. It was one of the biggest hits of 1987. This week in 1987, the song that would open the floodgates for a wave of Hi-NRG club hits debuted on the ARIA chart. In three weeks' time, it had catapulted up the top 50 to land at number 1, where it would stay for five weeks. Before that happened, "I Knew You Were Waiting (For Me) by Aretha Franklin and George Michael wasn't quite finished with the number 1 spot. 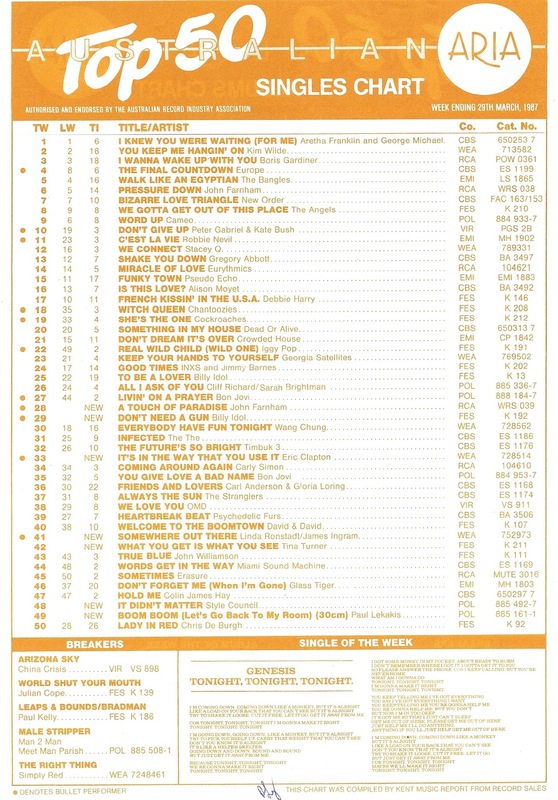 This week in 1987, the duet remained on top for a second week. I wonder if this song - the Canadian band's other US top 10 hit - would've done any better if released straight after "Don't Forget Me (When I'm Gone)". I liked it, even if no one else did. The Stems' first single through its deal with Mushroom Records made a slight improvement on the chart peak of "Tears Me In Two", but the Perth band still couldn't quite break through. Before they went all pop, this is the sort of song Genesis used to make - long, overblown and ultra-serious. On the Invisible Touch album, "Tonight, Tonight, Tonight" clocked in at just under nine minutes. For its release as the fourth single, the track was edited right back to four-and-a-half-minutes, but it didn't lose any of its heavy tone, which might explain why it didn't do so well in Australia. That and the fact the album had only just dropped out of the top 25 after nine months on sale. 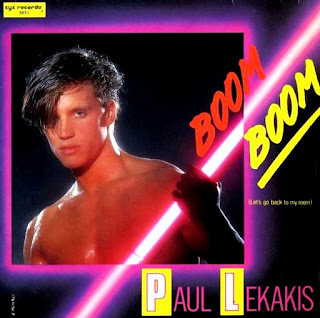 1987 just wouldn't have been the same without "Boom Boom (Let's Go Back To My Room)", a cheeky Hi-NRG floor-filler that seemed to come from nowhere and hog the number 1 spot for just over a month. The track was the debut single for American model Paul Lekakis, who was spotted in an Italian nightclub, no doubt thrusting and showing off his, er, assets like he did in the TV performance that served as a de facto music video. Subtle, it was not, but its audacity - along with its simplicity and catchiness - was part of the appeal. Sadly for Paul, the runaway success of "Boom Boom..." didn't lead to more chart success and he became the very definition of a one-hit wonder, despite subsequently working with Stock Aitken Waterman on the unreleased-for-decades "Fruit Machine". In the '90s, things became quite dire as Paul turned to prostitution, and battled drug and alcohol problems. These days, however, he's got it together and still wheels out "Boom Boom...", including on a visit to Australia last year as part of the Totally 80s tour. Sometimes diverging from a proven formula pays off for a band (see: U2, Depeche Mode); sometimes it doesn't. For The Style Council, who were known for their soul-influenced sound, the shift to encompass more of a dance and '80s R&B vibe was jarring for some. Clearly taking a leaf out of the Jimmy Jam & Terry Lewis playbook, "It Didn't Matter" did return the band to the UK top 10 but only just sneaked into the ARIA top 50 - the last time they'd be seen there. We'd last seen Tina Turner on the chart with "Typical Male", the lead single from Break Every Rule, but there'd been another song released between that and "What You Get Is What You See". 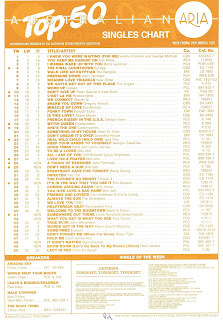 Seemingly lost in the Christmas period, ballad "Two People" had missed the ARIA top 100 completely. Tina got things back on track with "What You Get Is What You See", a rollicking good time of a song that featured Eric Clapton on guitar. Her biggest hit since topping the chart in 1985 with "We Don't Need Another Hero (Thunderdome)", "What You Get..." would almost become a hit all over again in 1989 when it was used to advertise rugby league. Singers had been teaming up to perform big ballads from live-action movies all decade, but this duet from An American Tail was the first (that I can remember) of a long line of cartoon collaborations. The heartfelt ballad was performed by Linda Ronstadt (biggest hit to date: "Blue Bayou", number 3 in 1978) and James Ingram (biggest hit to date: "Baby, Come To Me" with Patti Austin, number 38 in 1983), and written by future Titanic score composer James Horner with legendary songwriting team Barry Mann and Cynthia Weil. Even all these years later, I still get all emotional listening to the song, which won two Grammys and reached number 2 in the US - especially at the pre-chorus bit where Linda belts out, "It helps to think we're sleeping underneath the same big sky." I'm still surprised this didn't do better in Australia. A very different soundtrack hit now from a man who hadn't been seen on the top 50 in eight years. Taken from the Paul Newman/Tom Cruise pool hustler film, The Color Of Money, "It's In The Way That You Use It" was also included on August, Eric's most successful album in years. Surprisingly, the song wasn't a hit in the US or the UK, but in general, things were looking up for Eric after a troubled - musically and personally - start to the decade. The '90s would bring even more success. Next up, a male performer who'd had no shortage of success so far in the '80s. The follow-up to his biggest hit, "To Be A Lover", "Don't Need A Gun" is a song I rarely listen to (despite owning a Billy Idol greatest hits album) but it pretty much ticks all the boxes. Snarly, raspy vocals from Billy? Tick. Synth-rock production courtesy of Keith Forsey? Tick. Steve Stevens on guitar? Tick. It also contains the lyric that provided Billy's then-current album, Whiplash Smile, with its title and, overall, has actually aged pretty well. Given Whispering Jack had been firmly ensconced in the top 5 since October - mostly at number 1 - it's pretty impressive that third single "A Touch Of Paradise" did as well as it did on the ARIA chart. A change of pace after "You're The Voice" and "Pressure Down", "A Touch Of Paradise" had first appeared on Mondo Rock's 1982 album, Nuovo Mondo, but not been released as a single. Chosen for inclusion on Whispering Jack, John's remake was a clear choice for single release. As a bonus, the B-side of the single was a live version of "Help! ", The Beatles' classic that John had previously covered and taken into the top 10 in 1980. Next week: "Boom Boom..." is joined on the chart by another sleazy dance smash, while the lead singers of two chart-topping bands make their solo debuts. Interesting video still (I hadn't seen the video before) for 'Somewhere Out There'. With that blue tint and hairdo, Linda looks like a Dealette, a Booette, and a pre-Lady Gaga all-in-one. I don't think I knew 'Don't Need a Gun' at the time, oddly. 'A Touch of Paradise' was a nice song, and despite the success of 'Whispering Jack', it's surprising it only peaked at #24.